Chicago, IL (May 12, 2016) - City Winery-Chicago has announced first ever live shows with one of Rap’s most in-demand performers and MCs Talib Kweli to perform two shows during the Fourth of July weekend. 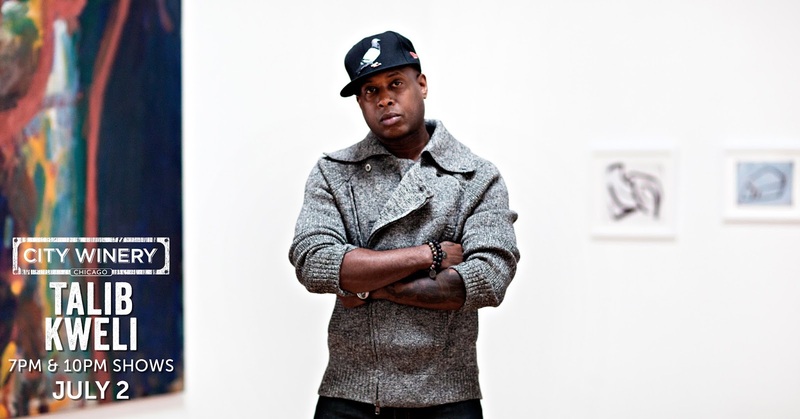 Talib Kweli’s tenure in the Hip Hop world continues to transcend boundaries. Socially conscious, Talib Kweli’s lyrics hold a mirror of self-reflection to humanity’s face, while musically creating an ambience of harmonic mastery. Locally and internationally renown, loyal fans, followers and supporters flock to see Talib Kweli making him no stranger to performing shows in Chicago. Talib Kweli, join a diverse mix of the most respected names in pop, rock, jazz, blues, world music, theater, dance, spoken word and comedy presented at City Winery Chicago, including previously announced headliners and supporting acts. Tickets for the shows go on sale to the public on Thursday, May 12, at noon at citywinery.com/chicago. About City Winery Chicago: Opened in 2012, City Winery Chicago is a fully operational winery, restaurant with outdoor patio, concert hall and private event space located in the heart of the West Loop at 1200 W. Randolph, in the historic urban Fulton Market district. Once a refrigerated food distribution warehouse, the 1911 building has been transformed into a contemporary 33,000 square foot haven for those passionate about wine, music and culinary arts. The décor evokes the romance of being in wine country, from the exposed stainless steel fermenting tanks and French oak barrels, to the aroma of fermenting grapes. Chicago’s only fully operation winery has produced dozens of in-house wines sourced from vineyards in California, Oregon, Washington, Argentina and Chile, including a Wine Enthusiast 90-point 2012 Bien Nacido Vineyard Reserve pinot noir. With more than 400 unique producers from around the world City Winery is recognized with 2014 and 2015 Best of Awards of Excellence “for having one of the most outstanding restaurant wine lists in the world” by Wine Spectator. The globally inspired, locally sourced, wine-focused food menu is conceived for pairing and sharing. The concert hall accommodates up to 300 guests, all seated at tables with complete beverage and dining service, ensuring a comfortable “listening room” experience enhanced by a state-of-the-art Meyer Sound system. Riedel is the official and exclusive provider of glassware, showing City Winery’s commitment to enjoying quality wine in a quality vessel. American Airlines is the Official Airline and Virgin Hotels Chicago is the Official Hotel of City Winery. For more information, please visit www.citywinery.com. 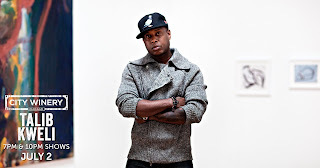 Talib Kweli: The Brooklyn-based rapper Talib Kweli earned his stripes as one of the most lyrically-gifted, socially aware and politically insightful rappers to emerge in the last 20 years. His travels around the globe as one of rap’s most in-demand performers combined with his conversations with political activists and his genre-straddling work with Idle Warship and others caused Kweli to realize that he was limited in a sense, a prisoner of sorts of his own success as one of the world’s best rappers with something significant to say. “My music has been associated with those types of causes, with positivity, spirituality, intelligence and being thought-provoking and such,” he says. “I think sometimes people get caught up in that part of me as an artist and don’t necessarily understand the musicality or fully appreciate the music and the entertainment value behind what I do. I tried to stretch my wings a little bit and bring something that was less beholden to the world of hip-hop and more existing in the world in general.” The result of this artistic growth and exploration arrives with Kweli’s dynamic Prisoner Of Conscious AKA P.O.C., an artistic tour de force that signals the start of the next chapter of Kweli’s remarkable career. The BK MC spent more time working on Prisoner Of Conscious than any of his other albums, a three-year journey that found him exploring new vibes, joining in some unlikely collaborations and taking him to foreign lands.